In the previous post of this series, we walked through the Installation steps for the SCUtils Knowledge Base add-on. In this post, we will go through the Post-Installation configuration required to begin using it. Launch the Self-Service Portal, and navigate to Help Articles, click on the Edit button (the icon with the piece of paper and pencil on it). 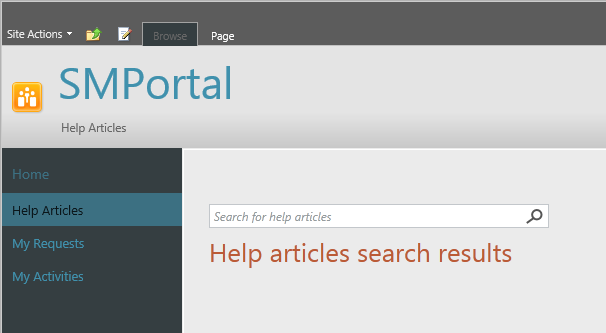 In Edit mode for the Help Articles web page, delete the default Web Part. You will be prompted with a confirmation to delete, click OK.
From the top menu select Editing Tools > Insert > Web Part. Under Categories select SCUtils, under Web Parts select SCUtils KnowledgeBase WebPart DEMO Version, then click Add. When I navigated to the Web Parts Maintenance Page, you will see that the Web Part is shown as being Open on the page. You can select the Web Part, and click Close. However, even though I did this, the Help Articles page still did not show the new Web Part. This usually happens if you didn’t install the Service Manager console on the SharePoint server. Please check p.2.1 of the guide. 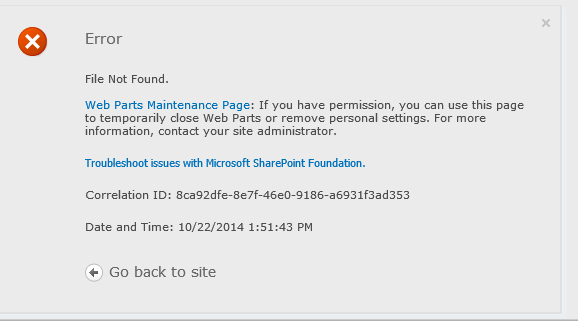 I checked my SharePoint server, and I did in fact forget to install the Service Manager console. So, after installing the console, I tried adding the Web Part again. This time I received the correct screen. After adding the new Web Part, you should see the following message: “Service is currently unavailable. Please contact Administrator.” This, according to the Vendor, means that the installation is complete. Click Save and Close. Next we need to configure the Web Part. With the Web Part added to the Help Articles page, we need to configure it. Navigate to the Help Articles page, click the Edit button to enter Edit Mode again, and this time, choose to Edit Web Part. In the Web Part configuration, expand the Service Manager Connection Settings area, and fill in the listed fields, then click OK. You will also need to Save the webpage as well. You can also change other aspects of the add-on, like its appearance, behaviour, etc. To do this, expand the Knowledge Base Common Properties area. Web Content Server URL – specify URL for the web content server if it has not properly defined automatically. Is this an Article Display Page? – set the current page as a default one for displaying knowledge articles in HTML format. The web part can be used in many pages but it is required that one page is set to be a default one. Number Of Last Modified – set the maximum number of the articles in the column Last Modified. The default value is 5. Number Of Top Rated – set the maximum number of the articles in the column Top Rated. The default value is 5. Number Of Search Result – set he maximum number of the found articles on the page. The default value is 5. Open a Knowledge Article in new tab/window? – if it is checked, knowledge articles are opened in a new tab or window depending on the browser’s setting. By default, it is unchecked. Show External Content URL – if it is checked, External Content URL is shown on the bottom of the page. By default, it is unchecked. Now that we have the SCUtils Knowledge Base add-on installed and configured, we can see it in action. In the next part this series, we will see the how it works.